Secretary of the Navy: The civilian head of the Navy, the secretary is appointed by the president with Senate approval and is responsible for recruiting, organizing, supplying, equipping, training and mobilizing naval forces. Chief of Naval Operations: The CNO is the senior military officer of the United States Navy and is a four-star admiral. A member of the Joint Chiefs of Staff, he is responsible to the Secretary of the Navy for the command of naval forces and is the principal naval adviser to the president. Commandant of the Marine Corps: The CMC reports to the Sectary of the Navy and is the top uniformed member of the Marine Corps. He sits on the Joint Chiefs of Staff and is responsible for the general readiness of the U.S. Marine Corps. Aircraft Carrier: These are the largest combatant ships in the Navy, measuring in at 1,000 feet in length and displace between 70,000 and 90,000 tons. They carry approximately 85 aircraft of mixed fighters, bombers and support, and are the primary offensive punch of the Navy. Amphibious Transport: These ships are used to transport and land Marines, equipment and supplies by embarked landing craft or amphibious vehicles. With a crew of 490 (24 officers, 466 enlisted men), they have helicopters to assist in amphibious assaults and usually carry a Marine Expeditionary Unit (MEU). Tank Landing Ship: The vessels can transport 29 tanks and more than 350 troops and their equipment to combat areas. They can also be used to launch amphibious vehicles from a stern gate, as well as land vehicles to a beach or causeway over a bow ramp. Guided Missile Cruisers: These ships range in size from 9,000 to 11,000 tons and 600 feet in length, with a crew of approximately 35 officers and 550 men. Capable of sustained combat operations in any combination of Anti-Air, Anti-Submarine, Anti-Surface and Strike warfare environments, their primary armament is the long range surface-to-surface Tomahawk Cruise Missile and the Standard Surface-to-Air Missile. Guided Missile Destroyers: These ships provide defensive support for Carrier Battle Groups, as well as Surface Action, Amphibious and Replenishment Groups. There are currently three classes of destroyers in service -- Arleigh Burke, Kidd and Spruance classes. Frigates: Smaller than a destroyer and designed as cost-efficient surface combatants, they lack the multi-mission capability necessary for modern surface combatants faced with multiple, high-technology threats. Still, despite their size, it is a robust vessel capable of withstanding considerable damage. Amphibious Command Ships: Equipped with a variety of air and surface radar, these ships provide communications for senior commanders and their staff while engaged in fleet operations. There are two classes -- Blue Ridge and LaSalle/Coronado Class. Mine Warfare/Countermeasure Ships: With a crew of eight officers and 76 enlisted men, these ships are designed to detect mines and clear them from vital waterways. Fleet Ballistic Missile Submarines: These nuclear-powered submarines are armed with long-range strategic missiles or ICBMs. With a crew of 15 officers and 140 enlisted men, these Ohio class submarines are designed to operate for 15+ years and they provide for the nation's most survivable and enduring nuclear strike capability. Attack Submarines (SSN): These are designed to seek and destroy enemy submarines and surface ships. Other missions range from intelligence collection and special operation troops delivery to anti-ship and land strike warfare. They also carry Tomahawk cruise missiles. Marine Expeditionary Force (MEF): The MEF is the principal war fighting element in the active force structure of the Marine Corps and is usually commanded by a lieutenant general. The size and composition of a deployed MEF varies depending on the needs of the mission. 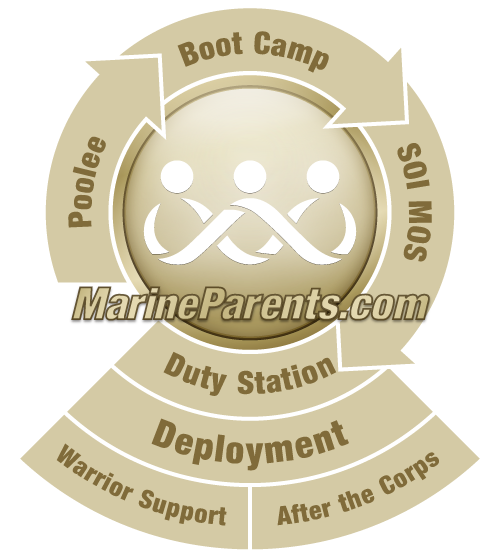 Marine Division: There are three Marine divisions in the active force and one in the reserve. It is the largest Marine ground combat organization of a MEF and is usually commanded by a major-general. Marine Expeditionary Brigade (MEB): A MEB, usually led by a brigadier general, is built around a reinforced infantry regiment, an aircraft group and a Service Support Group. Capable of rapid deployment and employment via amphibious or airlift methods, it is the first echelon of a Marine Expeditionary Force. Marine Expeditionary Unit (MEU): The smallest task force unit, the MEU has approximately 2,200 personnel and is built around a reinforced infantry battalion, a composite aircraft squadron and a support group. It is commanded by a colonel and is routinely deployed with an Amphibious Ready Group. The ground element of a MEU is a Battalion Landing Team (BLT), comprised of a reinforced infantry battalion of approximately 1,200 Marines, including three Rifle Companies. The aviation unit of a MEU is a reinforced medium helicopter squadron. Marine Air Wing (MAW): The largest Marine aviation organization of the MEF, each MAW has a unique organizational structure and is commanded by a brigadier general. Marine Aircraft Group (MAG): Similar to an Air Force Wing and commanded by a colonel, a MAG is the smallest aviation unit that is designed for independent operations. Image info: U.S. Marines assigned to 3rd Assault Amphibian Battalion observe the approach of amphibious assault vehicles (AAV) during well deck operations aboard amphibious transport dock ship USS Somerset (LPD 25). Somerset is currently participating in Exercise Dawn Blitz 2015 (DB-15). Exercise DB-15 is a multinational training conducted by Expeditionary Strike Group 3 (ESG-3) and 1st Marine Expeditionary Brigade (1 MEB) to build U.S., Japan, Mexico, and New Zealand's amphibious and command and control capabilities through live, simulated, and constructive military training activities off the coast and ashore at Marine Corps Base Camp Pendleton and at Marine Corps Air Ground Combat Training Center 29 Palms, California. Somerset is the ninth San Antonio-class amphibious transport dock ship. —U.S. Navy photo by Mass Communication Specialist 1st Class Vladimir Ramos.